Learn What Makes Hilton Sandestin Beach One of the Best Family Resorts in Florida! 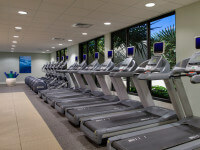 Hilton Sandestin Beach Golf Resort & Spa is a family resort near Destin, Florida. We offer tons of kid-friendly amenities — like bunk beds and a toddler pool — making us one of the best family resorts in the area. One of our most exciting perks for families is Kids Krew, a program of events and activities specifically designed to entertain children during your resort vacation. Get the inside scoop about this amazing family perk below — straight from our Kids Krew staff! 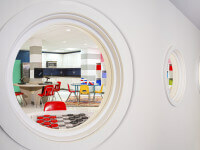 What can kids expect from the Kids Krew experience? We’re committed to being one of the best family resorts in the Destin, Florida area. With that goal in mind, Kids Krew is non-stop fun and no two activities are the same — from T-Rex races, to pillow fights and beyond. We like to do a lot of hands-on crafts and group activities that encourage attendees to be social, make new friends and be creative. And it’s easy to form bonds and friendships at Kids Krew — we often see groups of kids who met at Kids Krew playing together around the resort long after they’ve left our events and activities! What is the Kids Krew staff like? The Kids Krew staff is made up of roughly 20 members (varies seasonally). Many folks have previously worked at summer camps or as professional nannies — providing the perfect mix of creativity and enthusiasm, and prior childcare experience. Depending on the activity, anywhere from two to ten Krew members (or more!) will staff our Kids Krew events. We try to staff a ratio of one Krew member for every five children, so everyone gets plenty of opportunities to interact with the staff. What Kids Krew activities are the most popular? With so many unique and fun activities, it’s very hard to chose a favorite! Our fantastic events include “Awesome Arcade,” where kids play a live, interactive Pac-Man game – something not very many kids have the opportunity to say they've done! Our staff even dresses up in Pac-Man ghost outfits to amp up the fun. Kids also really enjoy “Crab Hunting” and “Camp Kids Krew.” At the latter, kids get to roast marshmallows over a bonfire and eat all the s’mores they can get! Our Wow Factor Science Show is also a big hit. This interactive presentation features a great scientist who makes learning a fun part of the vacation experience. We also do a lot of events inspired by pop culture — like our Paparazzi Pandemonium theme night for The Academy Awards, or our giant boulder run in tribute to Indiana Jones. Why should parents love Kids Krew and Kids Night Out? Kids Krew provides parents with a fun, safe, structured environment in which their children can play and be social. We’re here to entertain and care for the kids so parents can have more free time to check out our other resort amenities that their kids may not like (or may not be suited for), like a massage in our Serenity by the sea Spa, or a romantic dinner at Seagar’s Prime Steaks & Seafood. Our programs run throughout the day and night (Midnight Madness runs until 12am! ), giving parents plenty of time to themselves to discover all the resort has to offer. What is something people might not know about Kids Krew? We have regulars! 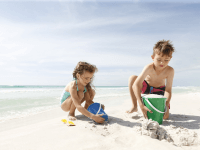 A lot of families return to Hilton Sandestin Beach year after year, and their children continue to attend Kids Krew events and activities each time they visit. We love it, because it gives our staff and attendees a chance to build strong bonds and have even more fun. It’s amazing to see former Kids Krew attendees grow up, start their own families, then come back to the resort to vacation in their adult years! Looking for a family resort near Destin, Florida? Come see why Hilton Sandestin Beach is one of the best family resorts in the area!